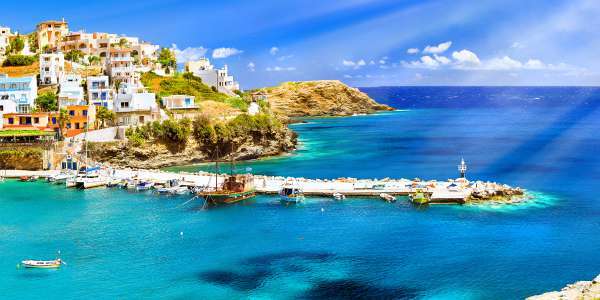 Here's your dream cruise to the exotic ports of Greece, Turkey and the Black Sea. Sail from Crete aboard the elegant Celestyal Crystal and enjoy luxury cabins, world-class cuisine and the best eastern Mediterranean ports of call. Reduced deposits - only $50! The largest vessel in the Celestyal fleet, the Majesty, provides an unforgettable luxury Greek getaway experience. Each voyage is complete with exquisite fine and casual dining options, an impeccably trained staff and lots of things to do when you’re not immersing yourself in Mediterranean culture, basking in the jaw-dropping beauty of the Grecian Isles or winding down at the end of a busy day at the ship’s own world-class spa facility. Rooms on the Majesty range from cozy-but-not-confined exterior and interior cabins to truly spacious luxury suites, with a number of balcony suites for anyone looking to start each day with a truly breathtaking ocean view. Add in the exceptional personalized (and award-winning) service Celestyal Cruises is known for and prepare for something that truly deserves to be called majestic. Explore your cabin options on the Majesty, from the luxurious Balcony Suites to the budget-friendly Interior Staterooms. All cabins come with exceptional, award-winning service. These cabins can accommodate two, three or four guests depending on number of upper berths. The room has a bathroom with shower, air conditioning, phone, TV, hair dryer and safety deposit box. The exterior staterooms have ocean views from large windows or port holes, and sleep up to four guests with upper and lower berths. The bathroom has a shower and a hair dryer. This air-conditioned cabin also has a phone, safety deposit box and a TV. These outside cabins accommodate two people perfectly, with two lower beds and a bathroom with shower. It is equipped with a phone, TV, hair dryer, safety deposit box, refrigerated mini-bar and a large private balcony. Balcony Suites on the Majesty are spacious cabins with room for four guests in two lower beds and a sofa bed. In addition to a large furnished balcony, the suites have air conditioning, bathroom with tub, phone, hair dryer, safety deposit box, TV, and a refrigerated mini-bar. The Celestyal Majesty offers a number of activities to engage both the body and the mind, ensuring there’s never a dull moment when on board. Want to bring a little bit of Greece back home with you? On the Majesty, Celestyal’s trained instructors can teach guests how to speak the local language, or how to cut a rug with some traditional Greek dance moves, providing a totally unique and immersive cultural experience in the process. Those swept away by the flavors of the Mediterranean will also be glad to know the Majesty offers cooking demonstrations led by their expert on-board chefs, where the best thing you ate during your trip can become something you know how to make for yourself. Other amenities include a gym, an outdoor sports program, lots of games and salon and spa facilities for that much needed pampering. 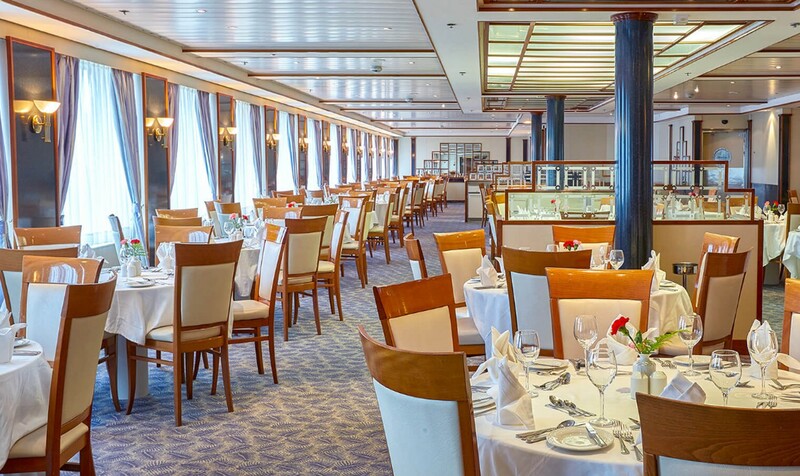 The dining options on the Majesty cater to a variety of tastes, with an eclectic array of international delicacies prepared lovingly and with locally-sourced ingredients. For unparalleled fine dining, the Four Seasons, the Le Bistro and Seven Seas restaurants offer an exquisite ambience perfect for romantic evenings or special occasions. For when you want to dine somewhere more casual, both Piazza San Marco and Café Royale boast eats that are fast, fresh and delicious. Caffeine junkies can get a pick-me-up at The Coffee Bar. Anyone who enjoys a well-made cocktail can grab a stool at Frame 52, Rendezvous, Royal Fireworks or Jubilee Lounge. Each travel package comes with three freshly prepared meals every day, plus an afternoon tea, but guests looking to upgrade can pay an additional fee for exclusive access to specialty menus and dishes.